05-01-18 Iowa Paralyzed Veterans Stars and Stripes Golf Outing is taking place August 4th, 2018. Get more details here. 05-01-18 Iowa Paralyzed Veterans Trapshoot will be taking place June 15 through the 17th. Find the flyer and registration form here. 01-08-18 The November and December Newsletter is now available. Download it from our site here. 11-10-17 News Article: New Wheelchair gives paralyzed veteran independence. Click Here to read more. 09-13-17 The July and August Newsletter is now available. Download it from our site here. 07-15-17 The Iowa PVA Golf Outing will be held on 8/26/17 at Warrior Run Golf Course in Norwalk, IA. Shot gun start at 11:00 a.m. Please see the golf sports section here and come out and join us. As you know, this is a fun event and all proceeds go to a really great cause! If you are unable to attend, please consider donating or sponsoring a hole! 07-15-17 The new May - June 2017 newsletter is available. Click here to dowload for your reading pleasure. 03-09-17 Join us in watching The Iowa Wild take on the Milwaukee Admirals at Wells Fargo Arena in Des Moines, IA on March 18th at 6PM. A ticket to this game includes the chance to see some great hockey as well as the opportunity to see a concert on the ice by the Celtic rock music group, Gaelic Storm after the game. Click here to get your FREE tickets. 10-26-16 VETERANS DAY CEREMONY AT THE IOWA CAPITOL GROUNDS All veterans and their families are invited to the annual Veterans Day Ceremony at the Memorial Grounds south of the Iowa State Capitol at 10 a.m. on November 11, 2016. The event is hosted by the Larry Nehring Detachment #103 of the Marine Corps League. A ceremonial firing will also be conducted at the Gold Star Memorial, 600 E. University, Des Moines (just west of Iowa Lutheran Hospital) at 9 a.m. on Veterans Day. 03-31-16 Have you ever wanted to do something nice for a Veteran? How about nominate them for a free home? Click here to find out more details. 03-08-16 Over the weekend of April 29, the local 75 chapter of the Experimental Aircraft Association will be hosting the EAA B-17 bomber from Oshkosh WI at the Davenport Municipal Airport for its first stop on the 2016 national tour. On Thursday April 28 there will be a veterans-only invitation, which will feature a media flight along with free tours available to all veterans. Friday April 29 thru Sunday May 1 there will also be free tours for veterans, along with flights available to anyone who has paid. These dates consist of the actual tour event and are open to the public. More information can be found on flights etc. download the flier or by visiting www.b17.org. If you have questions about the event, feel free to contact John Riedel, EAA Chapter 75 B17 Tour Stop Chair, at (563) 209-6005 or at johnriedel57@gmail.com. Representatives from Jason's Box will also be on hand for the duration of the weekend's event. 03-08-16 The January - February 2016 newsletter has arrived. Please visit our newsletter page to download and read it. 02-29-16 Please join us for the Annual Wheel Chair Awareness Bowling event! It is taking place on Sunday, April 10, 2016. Please download the flyer here for more details. 02-10-16 Please mark your calendars and attend the Home Base Iowa Military Online Career Fair, for veterans, service members, and their spouses on March 9, 2016 12:00 PM to 3:00 PM Central Standard Time (CST). Take a moment and visit the following link https://app.brazenconnect.com/events/direct-employers-13 to learn more and to register for the event. During this free event, you will have the opportunity to engage with recruiters from various Iowa employers looking to hire veterans, transitioning service members and their families in quick, text-based chat conversations - all from the comfort of your home, office, smartphone or tablet! 01-27-16 Today, PVA launched www.AirAccess30.org. The purpose of this website is to collect stories from PVA members and the disability community about their air travel experiences. This year marks the 30th anniversary of the Air Carrier Access Act (ACAA). As you know, PVA played a leading role in the passage of the ACAA. Now, we are working with the broader disability community to bring attention to the successes and failures in air travel for passengers with disabilities. The National Advocacy Program will be leading an initiative, in concert with our partners in the disability community, to reopen the ACAA and amend the law to improve the air travel experience for people with disabilities and to provide for recourse when our members and all people with disabilities have negative experiences in the course of that travel. We are calling on all PVA members to actively engage with us in this effort. Please share this website- www.AirAccess30.org -widely to ensure all PVA members are aware and encourage them to provide us with their stories. We will be using these stories to increase advocacy around the ACAA and improve air travel for all people with disabilities. 01-07-16 The November - December 2015 newsletter has arrived. Please visit our newsletter page to download and read it. 01-06-16 Has there been a state emergency declared? If so and you need disaster relief funds, please fill out the "Disaster Relief Form" provided by Parealyzed Veterans of America! 11-03-15 Sam's Club would like to say "Thank You!" to veterans by offering exclusive renewal and joining benefits for active and former members of the U.S. Military. View more details by clicking here. 10-30-15 - 2015 Veterans Day Events in Iowa Iowa Department of Veterans Affairs Executive Director, Colonel Robert King (Ret), encourages Iowans across the state to honor their military service members, veterans, loved ones, and those who made the ultimate sacrifice, by attending one of the many Veterans Day ceremonies and services taking place in Iowa. Many of those events are enumerated in a list attached to this email. The Iowa Department of Veterans Affairs will conduct its annual Iowa Veterans Day Remembrance Ceremony on November 11, 2015, at Iowa Veterans Cemetery, Van Meter. The ceremony will begin at 8:00 a.m. Guest speaker will be United States Congressman David Young. The Iowa Veterans Cemetery is located at the I-80 Van Meter exit (exit 113), just west of Des Moines. The annual Veterans Day Program in Des Moines will be held on November 11, 2015 at the Community Choice Credit Union Convention Center/Veterans Memorial beginning at 11:00 a.m. The convention center is located at 833 5th Avenue, Des Moines. This event will include representatives from all Veterans Service Organizations. Presiding at the ceremony will be Robert King, Executive Director of the Iowa Department of Veterans Affairs. The guest speaker is Terri Beer, Director, Regional Office, United States Department of Veterans Affairs, Des Moines. For more information, contact Adam Flack, 515.564-8031 or by email at aflack@iowaeventscenter.com. 10-29-15 Home Plate Diner is offering free meals to veterans who have proof of service (Veteran Card, D214) on Veteran's Day. Both locations, 304 East 30th Street in Des Moines and 3900 NE 14th Stree in Des Moines, is offering this fantastic opportunity for a great meal. It is just one way Ryan Buman can offer his appreciation for veterans. 09-25-15 Rally Point Cedar Valley Veterans Announces Launch Offering Iowa's Only Homeless and Transitional Shelter for Active Service Members and Veterans. Read More. 09-23-15 Join us for the Operation Engage American event on November 10, 2015. Click here for more details. 09-10-15 The July - August 2015 Newsletter is now available. Click here to download. 09-10-15 Terry E. Brandstad has proclaimed September 18,2015 as POW/MIA Recognition Day in the state of Iowa in honor of all returned U.S. POW's and captured, missing and unaccounted for from the Vietnam War, Korean War, Cold War, and WWII, and ask all citizens of Iowa to observe this day with appropriate cereonies. See the entire proclomation here. 09-01-15 On July 25, 2015, the Cedar Rapids Eagle Riders held the All American Bash Motorcycle Ride and Fundraising Event. All proceeds from this event were directed to the Iowa Chapter of Paralyzed Veterans of America. The event began with a ride which started at J&P Cycles in Anamosa. (J&P Cycles was also a significant sponsor of the event.) 70 motorcycles participated and made four stops before reaching the final destination at the beautifully renovated Veterans Memorial Building in Cedar Rapids, IA. Live music, food and silent auction was all provided at the Veterans Memorial Building. Several of the Iowa PVA Board of Directors and their wives were in attendance as well as National PVA Vice President Liaison Charles Brown (and Becky). The event was a huge success. On August 22, the Cedar Rapids Eagle Riders presented Iowa PVA with a check for $7500.00 raised at this event. This was the biggest one day fundraising event ever held by an Eagle Riders club. This is a fabulous group. Special thanks goes out to Mike Smith, Dale DeRues and Jim Delaney. 07-29-15 Do you have a spinal cord injury, disease, or disorder? If so, you have been cordially invited to attend the 11th Annual Adaptive Sports & Recreation Expo. This will be held on Saturday August 15, 2015. For more information, please visit our sports sections by clicking here. 07-09-15 The May and June Newsletter is now available for download. You can find it here. 07-01-15 iGive.com July $1,000 Contest and $5 New Member Bonuses Mean Bigger Donations for Paralyzed Veterans of America - Iowa Chapter. 06-30-15 The Iowa Chapter of Paralyzed Veterans of America mobile app. is now available for download at the Apple App Store or Google Play. Downloading this app. to your mobile device provides an instant $1 donation to Iowa PVA, provides event information, provides information about our organization and enables you to donate simply and directly to Iowa PVA. 06-24-15 There will be a motorcycle ride, food/beverage and live music fundraising event held on July 25 in Cedar Rapids, Iowa. The event is being presented by the Cedar Rapids Eagle Riders and all proceeds will benefit the Iowa Chapter of Paralyzed Veterans of America. Please come out and support our veteran heroes! 03-16-15 "Your Future Awaits" scholarship program is taking place again this year. Applications will be accepted through June 17, 2015. Click here to learn more. 03-04-15 The 2015 Annual Trapshoot and Pistol Shoot have been scheduled. For more information and registration sheets, please view our sports page by clicking here. The Cedar Rapids, Iowa Eagle Riders are holding a fund raiser for the Iowa Chapter of the Paralyzed Veterans of America. 100 percent of the funds raised through this booster will be donated to the Iowa Chapter of the Paralyzed Veterans of America. All money donated to the Iowa PVA STAYS in Iowa to support our Vets. Click here to learn more. 01-27-15 On February 27, 2015 check out the "Writing My Way Back Home - Free Midwest Veterans Writing Workshop" on Eventbrite! Click here for more details. 01-15-15 The November and December 2014 newsletter has arrived. Download your copy here. 11-14-14 New Update for VACAA - Veterans Access, Choice, and Accountability Act - Download it here. 11-05-14 This morning the VA is announcing the initial role out of the choice program, a provision of the Veterans Access, Choice, and Accountability Act (VACAA). Below is an Open Letter to Veterans from VA Secretary, Robert McDonald earlier. Here is the fact sheet for the Choice Program. You can read the fact sheet for the VACAA here. 11-05-14 Please click here read the open letter from Secretary McDonald explaining the Choice Program. 10-31-14 On Wednesday afternoon, February 25, St. Ambrose University will host the Eastern Iowa / Western Illinois Veterans Conference, which is a collaborative event between SAU, Black Hawk College, Eastern Iowa Community College District, and Western Illinois University Quad Cities. The theme for this year's conference is "Seek the Middle Ground: Bridging the Divide from Military to Civilian" which will look at ways for civilians and military to commonly address issues that divide them. For more information, or to register to attend for FREE, visit www.sau.edu/VeteranServices. 10-29-14 Coming Spring 2015: Veterans Recreation and Education Camp for Individuals with SCI/D. This event is hosted by the University of Arizona. Want to learn more? Click Here for the brochure. Want to apply? Click here for the application. 10-28-14 The September and October 2014 newsletter has arrived. Download your copy here. p>09-17-14 A new map and flyer have been provided for the Honor flight. If you downloaded the previous version, please download the updated one here. 09-15-14 On September 30 nearly 400 Central Iowa Veterans will board an Honor Flight to Washington D.C. where they will have the opportunity to visit the World War II and Korean War memorials. The Polk County Board of Supervisors have supported this event and our office has been asked to help gather community support to send the Veterans off on their flight. If you would like to be part of this special day, download the information pamphlet here. 09-09-14 The 2014 Norther Lights CFC (Central Iowa) Campaigns have begun. Please visit www.northernlightscfc.org to donate. Our campaign number is 32567. 09-08-14 The 2014-2015 Sports and Recreation schedule has been released. Please visit the sports section for upcoming events or click here to be directed directly to the page. 08-06-14 The July and August 2014 newsletter has arrived. Download your copy here. 07-12-14 The 2014 Red, White, and Blue Golf Outing is August 2nd 2014. Please go the golf portion of the web page here, to download your registration form. 06-17-14 100% Disabled Service-Connected/Dependency and Indemnity Compensation (DIC) Property Tax Exemption Forms Available. Read the entire press release here. 05-29-14 May - June's Newsletter just arrived. See it here. 05-27-14 We have PVA's response letter to Sherman Gillum for download here (in .PDF format). 05-27-14 We have Sherman Gillums open letter to veterans for download here (in .PDF format). 05-26-14 PVA Associate Executive Director for Veterans Benefits Sherman Gillums was on CBS This Morning to discuss the story this past weekend regarding the Senate VA Committee Ranking Member Richard Burr (R-NC) and his open letter to all veterans and the response of veterans service organizations, including Paralyzed Veterans of America. Check it out here. Update to Sherman Gillums story - Please tune in to watch AED of Veterans Benefits, Sherman Gillums, being interviewed tomorrow 5/27 on CBS This Morning, during the 7 am hour (EST). He will be responding to Sen. Burr's open letter to veterans that was put out on Friday. See his written response here. 05-05-14 Thirty elderly or disabled homeowners in the greater Des Moines area are getting major home renovations thanks to hundreds of volunteers. Click here to see the news feed from KCCI. 04-08-14 The 2014 Hoopin' At The Dome, 3 on 3 basketball tournament to be held in the shadows of the Iowa State Capitol in Des Moines is only ONE month away. This fast paced outdoor tournament showcases teams from all over the state. Click here for more details. 03-11-14 Are you a Veteran seeking a rewarding career with an organization devoted to serving our Veterans? Come to our Veterans Hiring Fair on March 14, 2014, from 1 pm to 4 pm at Camp Dodge, Gold Star Museum, 7105 NW 70th Avenue, Johnston, Iowa. Download Flyer. 02-25-14 New ID Cards for Vets Enrolled in VA Health Care - Click here for more details. All Veterans who are enrolled and have the old card should have their new replacement card by July. 02-16-14 The 2014 Adaptive Cycling Clinic is coming soon! Please click here to check out the nearest location and time. 02-10-14 The 2014 PVA National Trapshoot Circuit will be held at Otter Creek Sportsman Club in Cedar Rapids, Iowa June 27, 2014 through June 29, 2014. Click here to see the flyer! 01-31-14 Prosthetics Delay Report Form is now available, click Veterans Benefits for more details. 09-06-13 "I Want a Job - How Do I Get One?" series is being presented the great people at Easter Seals. Limited space and availability so you better sign up now. Click Here! 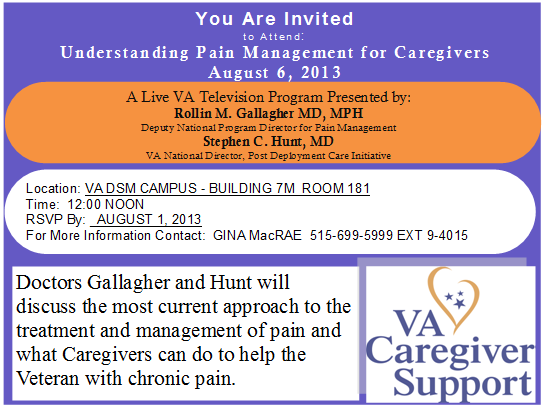 07-31-13 Attend the video seminar of "Understanding Pain Management for Caregivers. This seminar takes place on August 6, 2013 at 12 noon. See flyer here. 03-09-13 New Article posted by Sherman Gillums Jr., Associate Executive Director of Veterans Benefits. This article relates to a Veteran's issue on prosthetics. Click here to read the article. 01-28-13 SportAbility of Iowa made a New Year's Resolution: to find out what sports and recreation activities their participants want and do their best to offer them where and when they want them. To do this, they've created a brief survey (it should only take a few minutes of your time to complete). Will you please take a few moments to help them help you discover your abilities and achieve independence by offering the programming you want? Click here for the survey! 01-25-13 Catch the upcoming performance of Neil Simon’s Biloxi Blues at Stephens Auditorium on Feb. 15 at 7:30 pm. The Montana Repertory Theatre will perform the play which is about young men going off to war. These men are universal soldiers facing the same fears, anxieties, and loneliness that grip all young recruits about to encounter the ultimate test of combat. Mr. Simon brings his great sense of humor and humanity to every word of this magnificent play. Check the flyer out by clicking here and order your tickets by downloading the order form from here. 01-17-13 Spinal Cord Injury Association of Iowa is holding a bowling event on February 2, 2013. If interested, please click here for details on time, location, and how to RSVP. 01-03-13 Adaptive Sports of Iowa is looking for Veterans for their program. Click here for more details. 11-15-12: Iowa PVA is in the process of changing to a new unified logo. At the top of the screen and to the right of the screen you will find this new unified logo. We hope this new logo has a refreshing and inviting look. Do you have thoughts on this new logo? E-mail us at info@iowapva.org and let us know.